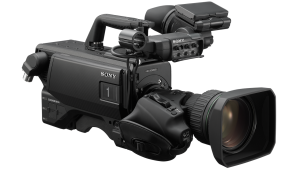 LAS VEGAS — April 7, 2019 — Sony Electronics today announced the latest member of its HDC family of 4K live camera systems. HDC-5500 is a new multi-format live camera capable of direct 4K signal output in 12G-SDI carrying the world’s first 2/3-inch 4K global shutter three CMOS sensors that ensure superb image quality in HD, 4K and HDR live production. By installing optional software, users can achieve a high frame rate up to 4K 2x and HD 8x*. Sony Electronics’ Imaging Products and Solutions – Americas group develops and manufactures video and audio technologies and solutions for a range of professional applications. These include broadcast television and motion picture production, live event production, ENG/EFP, digital cinematography, and more. Sony professional technologies are used in market segments including media solutions, imaging solutions, education, visual simulation and entertainment, theater, healthcare, and sports. Visit pro.sony for more information.